When the recipe calls for sour cream, call for creamy, economical and lower-fat INSTANTWHIP® TATER TOP sour dressing instead. It is the premium alternative that offers more versatility, longer shelf life and cost savings than regular sour cream. Used as a topper or as an ingredient in your most popular recipes, delicious TATER TOP goes wherever dairy sour cream goes, in equal proportions. It blends deliciously in fillings, salad dressings, dips, hot or cold sauces, on baked potatoes, and in all your favorite main dish, side dish and dessert recipes. No matter how you use it, TATER TOP’s body will hold up under the most rigid food service demands, and your customers will praise its fine rich flavor. Ordering INSTANTWHIP® TATER TOP couldn’t be easier – whether it’s from your local Route Sales Team, online or with a phone call. Add Wasabi paste or powder for a spicy topper on baked potatoes. Use on top of enchiladas, tostadas and more for refreshing, creamy coolness. Nothing adds creaminess to Beef Stroganoff like INSTANTWHIP® TATER TOP. Blend it with mayonnaise and a good bleu cheese for a French-inspired salad dressing. 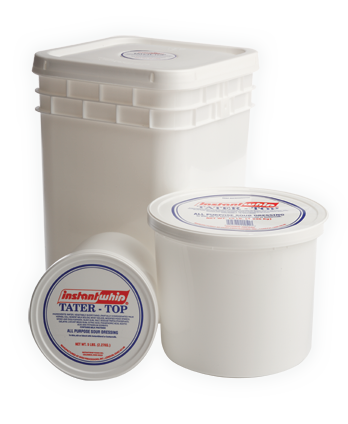 Create your own exciting dip or dressing ideas – INSTANTWHIP® TATER TOP is an ideal flavor base. Refrigerated at 35º-40º, 90 Days, unopened. Can be used in an recipe calling for sour cream. Keep refrigerated.